The unit is self contained with all cooking utensils, pots and pans, crockery and glassware. You will need to bring your own food. Tea, coffee and milk are supplied. If however, cooking isn't your thing there are plenty of restaurants and excellent cafe's just a 2 mins stroll away at the local Manly Village. Shopping is plentiful in the area with the Coast Plaza a 5 mins drive away. There is also movie theatres and a ten pin bowling alley for fun when perhaps there is a wet day. Off street parking is available for guests right out in front of the unit. This does not obstruct your lovely view of the bay. Gulf Harbour is just a 10 minute drive away at the end of the Whangaparaoa Peninsula and has one of the country's largest marinas and a world class golf course (Gulf Harbour Country Club). From Gulf Harbour you can catch a ferry to Tiri Tiri Matangi Island bird sanctuary which was established to preserve New Zealand's rare and endangered plant and bird species. There are a variety of walking trails across the island and guided walks. The island supports saddlebacks, kiwi, takahe, bellbird and other native birds no longer seen on the mainland. Shakespear Regional Park is just next door to Gulf Harbour which has recently become a native open sanctuary for NZ rare birds. It offers stunning cliff top views of the Hauraki Gulf, Rangitoto and Auckland city skyline.It too has fabulous walks you can enjoy as well as a beautiful beach. Manly Beach is the home to the Manly Sailing Club whose commodore is Sir Russell Coutts and are to be the hosts of the 2019 O'pen Bic World Championships. Previously in 2014 the National Optimist Sailing Regatta and the RSX National Sailboard Regatta were hosted by the club..
Other attractions nearby include Snowplanet, Orewa Beach, Wenderholm Regional Park. Lay in bed and enjoy the sea view. Clean and comfortable with a view. Spotlessly clean, comfortable and well designed to take in the view, even from your bed. Quiet location, yet well positioned, only minutes from beach, shopping centre and restaurants. Had a lovely stay. Fran and Murray were very welcoming and helpful. The accommodation was really nice with everything I needed and more. Would definitely stay there again. 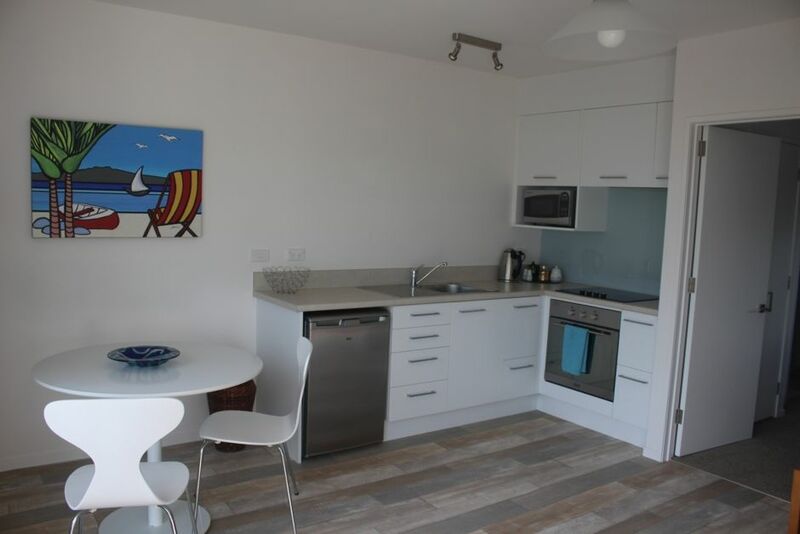 The beach is only a few minutes walk away and the shops, bars and restaurants within a short walk. Frequent bus services. Excellent. Modern, clean and very welcoming. What a lovely spot. Our host was very obliging, and easy to communicate with. The unit was clean and very modern. Such a lovely touch with Xmas goodies, and fresh fruit. Thank you. We very much enjoyed our stay at Hibiscus Haven. We would happily stay here again. Beautiful location. Everything within very easy reach. Bach was spotlessly clean, very well laid out and equipped. Would highly recommend. Perfect location for where we needed to be.